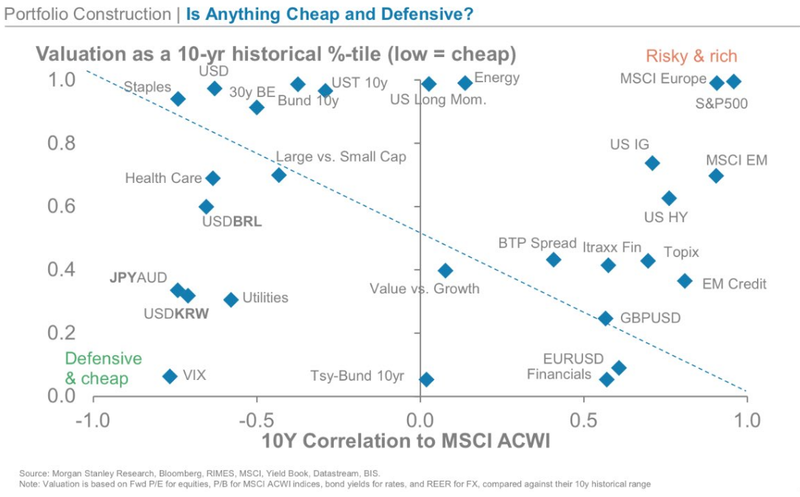 One of my favorite Twitter follows @LadyFOHF shared the below scatter chart from Morgan Stanley that attempted to map areas of the global market that were both cheap (valuation ranks at the lower end of its 10-year history) and defensive (a low or negative correlation to global equities). 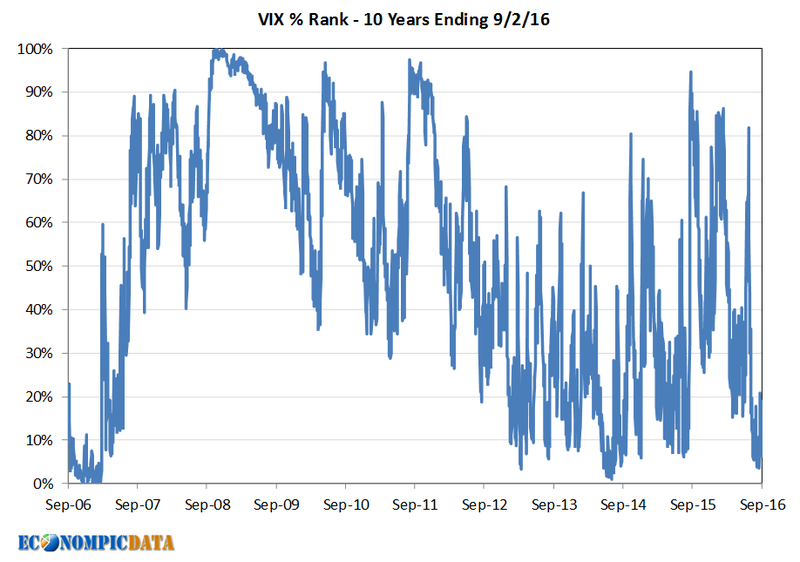 One of the few trades listed as having both characteristics was the VIX Index. Let's take a look. The chart below shows the percentile rank of the VIX index over the ten year time frame outlined in the Morgan Stanley chart. 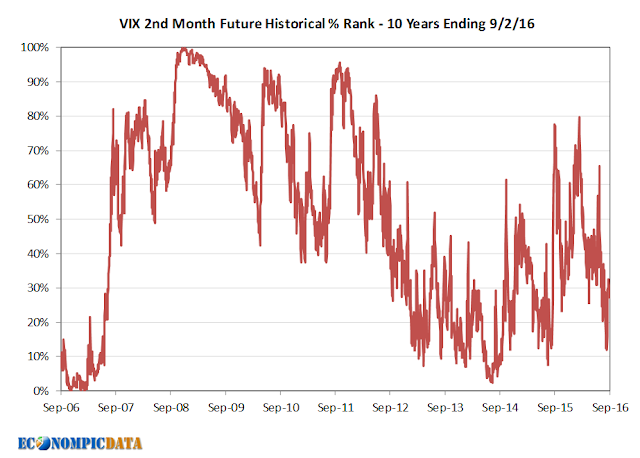 The VIX Index was indeed near it's all time low, ranking in the lowest 6th percentile of its ten year history at Friday's close (9/2/16) when the VIX closed at 11.98. But an investor cannot invest in the VIX Index. Rather an investor can buy or sell the consensus view of where the VIX will be, most easily through VIX futures or ETPs (for more details on the VIX term structure, take a look at a past post here). 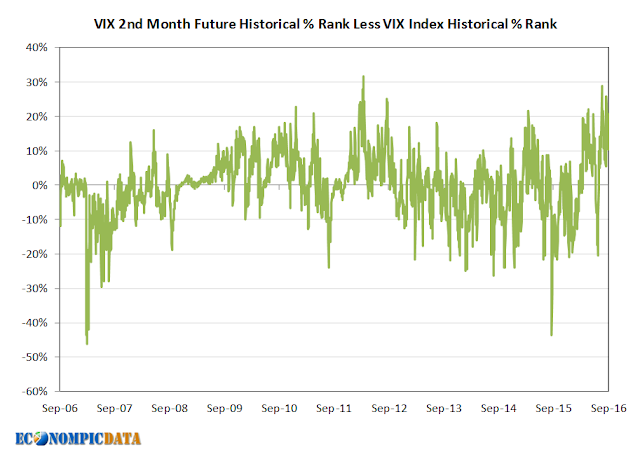 The below looks at the rank of historical 2nd month VIX futures contract prices (i.e. where consensus views the VIX as being when the 2nd closest VIX future contract matures - which currently makes up the largest holding of VIX ETPs) and we see a different picture. As of Friday's close, the second month contract was "only" in the 30th percentile in terms of price at a value of 16.375, more than 35% higher than the VIX Index itself. 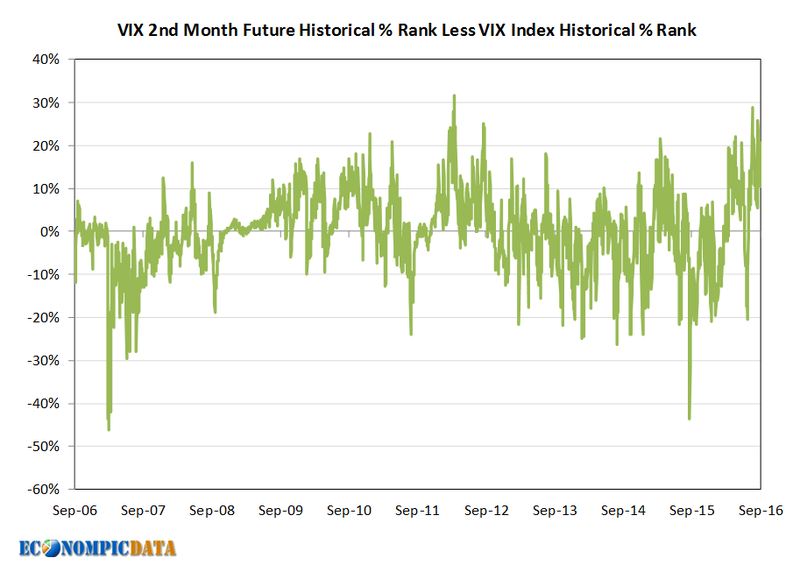 This 20%+ gap in rank of the VIX Index and the 2nd month VIX futures contract is pretty extreme, indicating investors believe (and are pricing in) a higher VIX in the future that is more "normal" to history; a very different view than the exuberance the current level of the VIX implies. Going back to the initial question of whether the VIX is cheap... the below chart takes the historical gap (from the green chart above) and projects out forward daily performance (annualized) of the S&P 500® VIX Short-Term Futures Index (the index benchmarked within the VXX ETP) of various scenarios. Similar gaps show that VIX prices were at extremely expensive levels (not cheap levels) and it actually presented a buying opportunity for the S&P 500 (11.9% returns when the gap was positive). 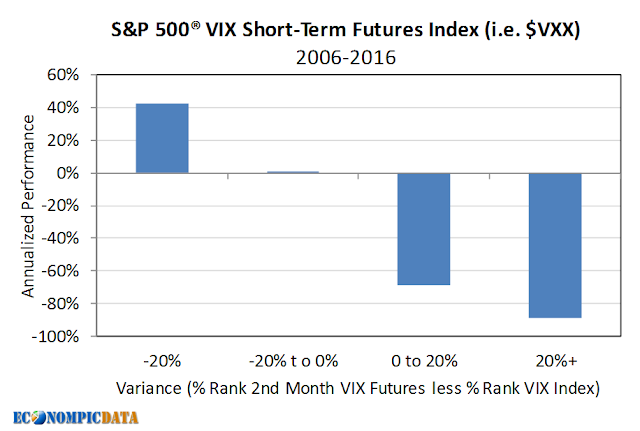 To summarize... while an investor should hardly ever be long VIX futures as they rarely provide a positive return, it is the the term structure of the VIX (i.e. VIX futures relative to the current level of the VIX), rather than the level of the VIX itself, that is likely to be a better signal of whether VIX futures are rich or cheap.